Here are some passages from Amazon.com reviews of Wapnick's How to Play SCRABBLE Like a Champion. Click on the book's image to buy the book. "I don't think I have ever seen so many valuable instructions for playing top-caliber Scrabble in a single book. The book also captures your attention with subtle humor and several personal stories that illustrate the principles being taught. Definitely worth every penny and then some." "Wapnick shows you how to lift your game, how to reinvent your approach to it. This is a very well written book with plenty to learn on every page. It is NOT Scrabble for Dummies. As others here have said, this is a book for the tournament player or only a player who aspires to improve. And if that person reads this book seriously, he will in fact get better." "I feel the book shines when pointing out the amount of "scheming" that goes on in a game among experts. Shining the light on this "meta-strategy" (inferring whether or not your opp has a letter or whether (s)he thinks you do, etc) pays for itself alone. After all, it is a book about playing at the highest level." 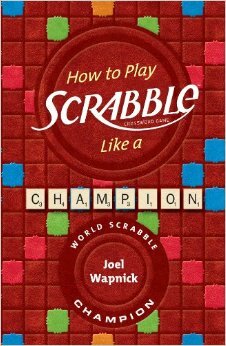 "Wapnick, a great SCRABBLE® player who has been World Champion, National Champion, and National Canadian Champion, has updated and added to that earlier book to present a book that no serious tournament SCRABBLE® player should be without. The book not only covers basics of strategy and tournament play, it explains the detailed analysis experts use in determining their moves and preparing for tournaments."